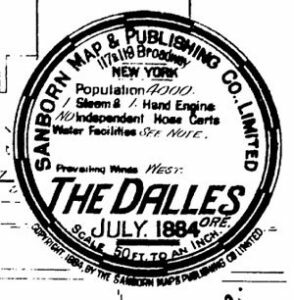 The Sanborn maps of The Dalles, Oregon (in Wasco County) are back online. It’s been one of the main research tools that my gentle readers have missed the most during this website’s recent “senior moment” of confusion and forgetting where to find pages. A website update like this may not look like much, but it takes a bit of time to string together this many links and as remote as the concept might be of the History Queen making an error, it is possible. Let me know if you find anything amiss at info@historicthedalles.org.